There is nothing better than having a daily reminder of life's important messages to keep you grounded and centered in this crazy world. That is exactly what student's walked away with after completing the Message In a Bottle workshop held at Queen's Ink. 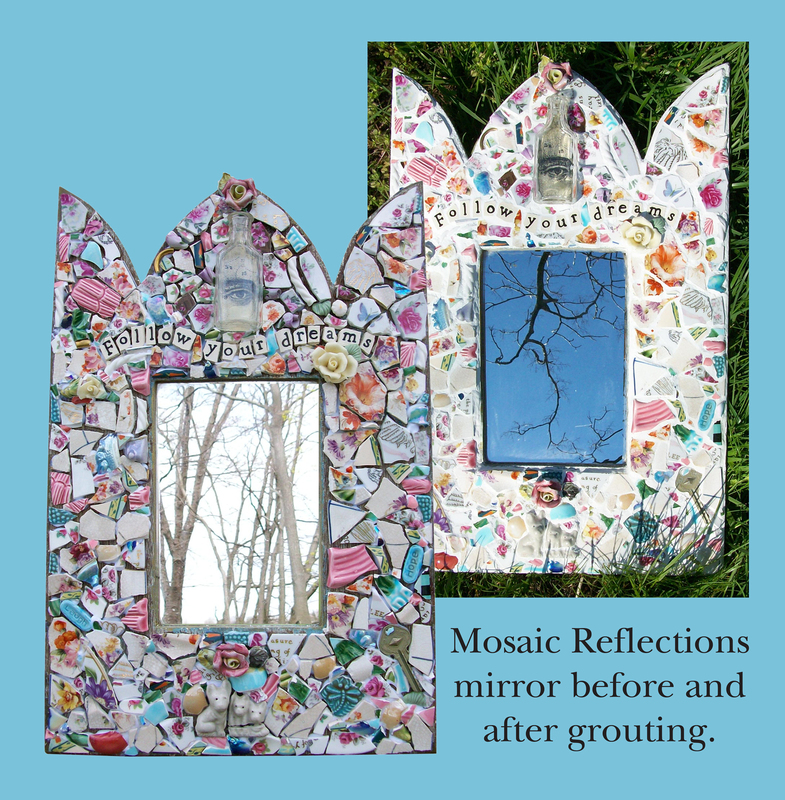 Deb provided instructions to transform a blank canvas into a beautiful piece of art work. 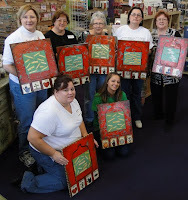 Students used painting techniques to layer color and create depth, as well as decoupage techniques to add special messages and wisdom cards. At the end of day, everyone had a beautiful piece of artwork that showcased their creative talent and personal insight. We had our grande debut at Queen’s Ink on Saturday, September 18 to rave reviews! Creativity was in the air during our morning class, Nurture Threads lead by Dee. Students worked with fabrics, paints, stamps and our own collage sheets to create beautiful pieces of art, encased in decorated frames. Everyone left the class excited to go home and find a spot for their new artwork. Speaking of, be sure to check out our upcoming workshops at Snow HIll! is just what we need as we head into the fall. Start by updating your studio. Look for the newest stamps, the latest collage sheets and the most recent ink colors at Queen's Ink in historic Savage Mill. Proprietor Patti Euler keeps up with the latest art trends and makes sure to keep the best and most unique items in stock. 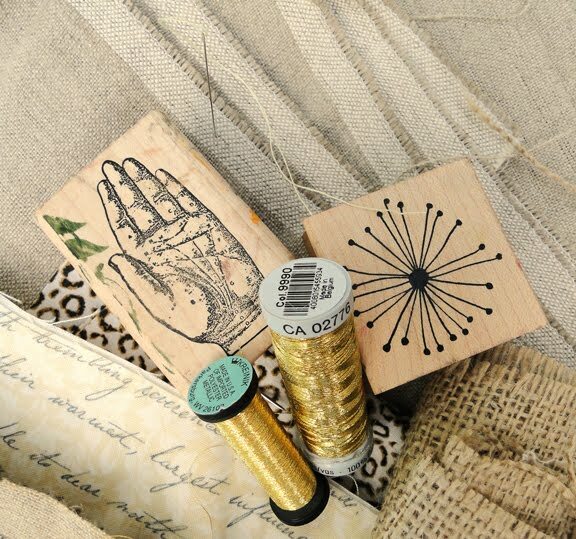 If your creative soul needs some direction with these new purchases, then be sure to check out the Queen's Ink class schedule. With natural light and open space, the QI studio is the perfect place to recharge and have some fun. 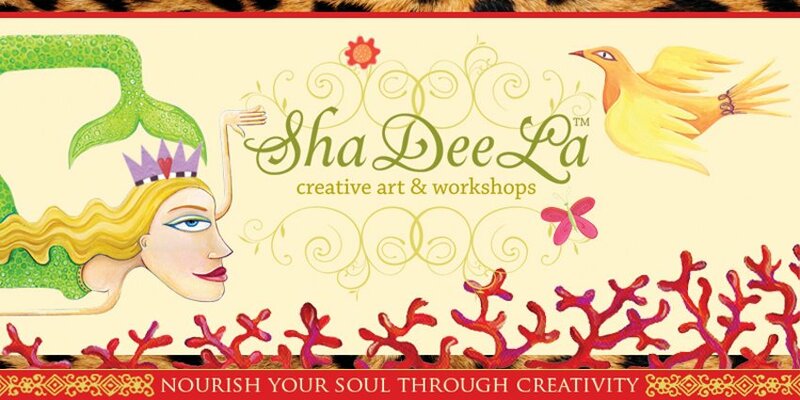 Don't forget to sign up for the ShaDeeLa Nurture Threads and Soul Affirmation classes. Space is limited and filling fast. When Dee and Deb's father, a fine artist, offered ShaDeeLa linen canvas scraps, we snatched them up. While we weren't sure what we would do with them, we were confident we could create something great. With a swatch in hand, Dee headed to the fabric store for a quick trip and inspiration. The textures, the colors and the imagery got the creative juices flowing. In her studio, she began experimenting with combinations of fabric, rubber stamps, paper, original artwork, mica powders and golden thread. The final product was the inspiration for Nurture Threads. A great project for all levels. The next Nurture Threads class is being offered at Queen's Ink on September 18, 2010. Sign up soon as the class is filling up quickly! This past weekend we returned to the art district of Snow Hill to teach our “Soul Affirmations” workshop. The class was held at Bishop’s Stock, a local art and wine gallery, which was the perfect backdrop for a soul searching and creative day. Class began with Sharon explaining the definition of affirmations (a personal truth, for those who were unable to make it) and invited everyone to leave the cares of the world behind as they explored their own truths and creativity for the day. Dee then gave a quick overview of the day and discussed the (soon to be famous) ShaDeeLa Class bag. 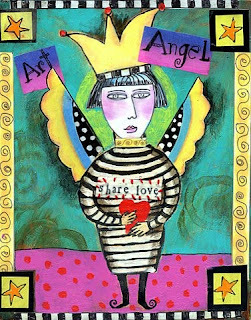 Included in the bag for this class was the blank board book, grunge board, creative collage sheets, ‘soul’ tile, affirmation sheet (for a little soul nudge) and wooden crown and heart. Dee also went over the lay of the room, noting the “Share” table, loaded with stamps, ink pads, paints, brushes and scrap paper. To get everyone started, Deb demonstrated the faux copper finish for the cover of the book, adding patina to give the Old World weathered look. Students then went to work on their own books, completing the cover and several pages throughout the afternoon. 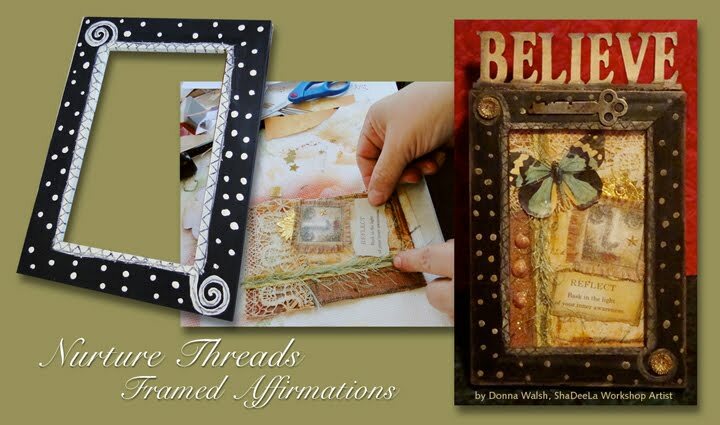 The final touch was a beautiful ribbon, run through grommets and tied into a bow, to keep those affirmations close. The end projects were amazing, not only to us but to everyone in the class. The individual creativity was in abundance and a great reminder to us all that we are all creative, and should be so each and everyday. Everyone left with a special little book that reminds us of this fact and other little positive anecdotes, whenever we may need them! ShaDeeLa's June class focused on recapturing youthful confidence and laissez-faire attitude. Starting with a blank canvas, instructors Sharon, Dee and Deb worked with students to turn childhood photos into modern, personal works of art. 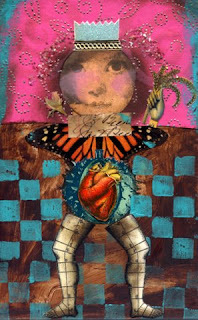 Students were encouraged to experiment with texture and color, with a focus on layering the two, by using stamp and transfer techniques. Everyone walked away with a picture perfect canvas... and a reminder that we all still have a little attitude! To open up the workshop, Dee shared several prototype examples, while reviewing the basic techniques of working with polymer clay. ShaDeeLa's students then began their mermaid contour "foundation" forming the essential parts that would be put together at the end. The parts were then given texture, pattern and interest using rubber stamp impressions. The "push mold" faces were adorned with clay accents such as hair, crowns and halos. While the clay parts were in the oven baking, ShaDeeLa artists enjoyed a tea and cookie break as they pulled together the final accents to be added to their crafted Mermaid. 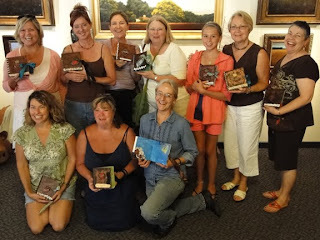 After the clay cooled, artists embellished with color washes, seashells, jewels, beads and of course, glitter! The parts were assembled with wire, jump rings and beads completing a beautifully articulated Mixed Media Mermaid! ShadeeLa’s workshop artists created cheerful jointed dolls sculpted with Sculpey Ultra Light clay in June's workshop. Copper wires were inserted into the sculpted legs, arms, torso and head and baked for 20 minutes. Each doll part was painted, adorned with rhinestones, beads, glitter, sealed with a satin varnish and then assembled. Each doll had a finished size of approximately 6 inches tall. 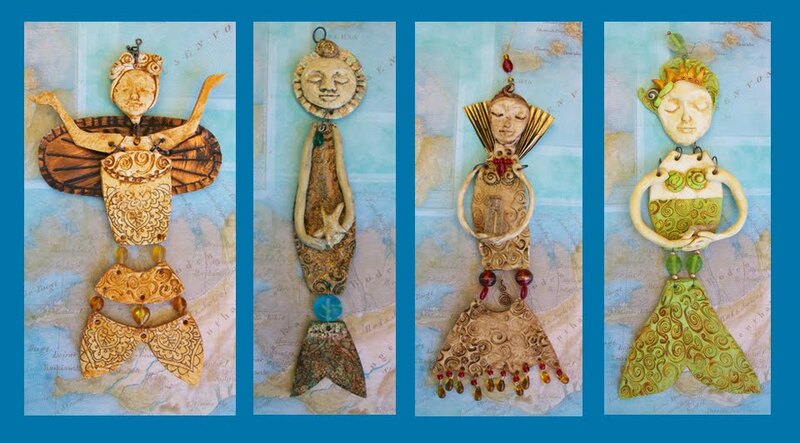 They all had unique shapes, adornments and colors. It was fun to hear the names that each Flower Doll was assigned. This was a full day class that included an incredible potluck lunch prepared by all attending. This workshop was developed specifically to spark that creative ember that glows within all of us and to keep that flame alive and burning bright! Whether you are a writer, musician or an artist, your most creative ideas always seem to arise while in the shower, in a traffic jam or when tossing sleeplessly at night. Noting your ideas when they arise is crucial to the creative cycle. 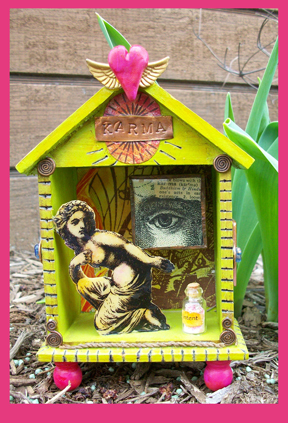 These boxes were designed to establish a holding place for written or sketched thoughts for future attention when one’s artist cycle is in its full moon. 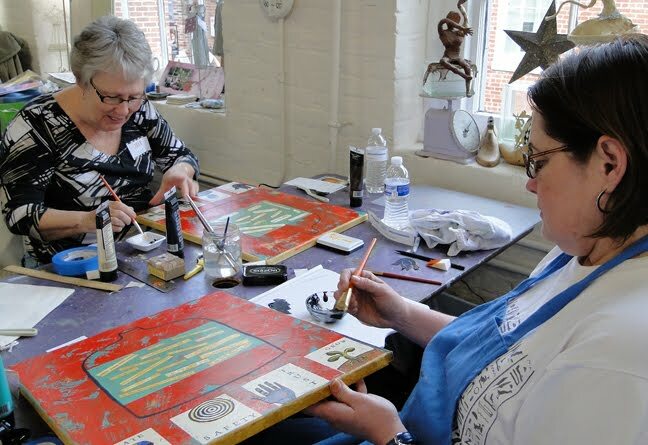 While openly sharing their best known discovery (or aha) moments, students learned the technique of carving their own handmade rubber stamp using a linoleum cutter and a rubber blank. 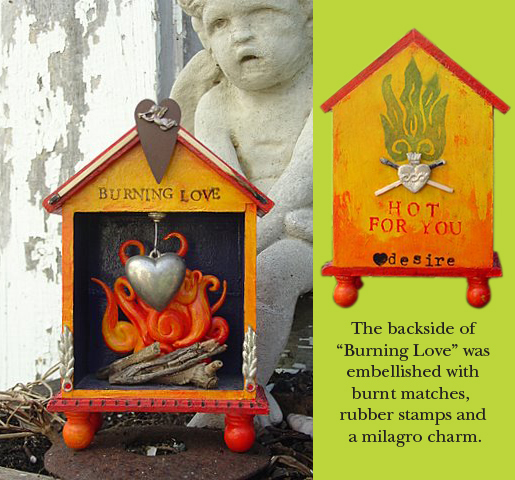 The circular boxes were adorned with paint, rubber stamping, burnt matchsticks and finalized with wood-burned accent. To honor the coming of Spring, ShaDeeLa’s guest instructor, Auralea Krieger from Nature’s Soul Miniatures led the “Miniature Garden Delights” workshop. 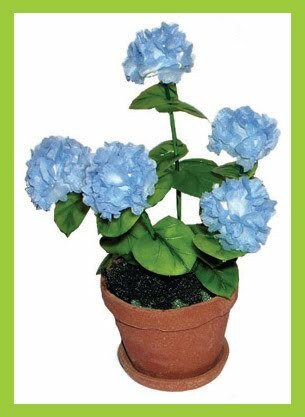 Kits were distributed with everything we needed to create our own potted Hydrangea plants. They contained pre-cut tissue petals, hydrangea stalks, pre-cooked polymer clay heads, leaves and even a clay pot for the flower! Auralea shared her special techniques, inspiration and guidance and some of us cultivated our own. All participants left with their own miniature piece of art to cherish or give as a gift and most of all we left with a newly learned craft and a blossoming of our creative soul. 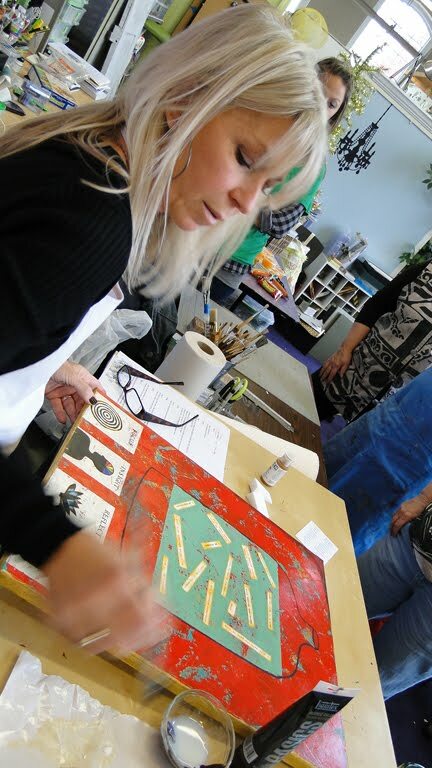 Students did not need to have drawing or painting experience to learn easy decorative faux techniques and finishes in March’s workshop taught by instructor Deborah Rolig. Exploring the very useful step-by-step instructions on surface prep, paints, glazes, washes, crackle, transfer and texture techniques, students were able to achieve unique and stylish, distressed masterpieces. Everyone went home with a finished piece of original art that was ready to hang! ShaDeeLa student’s had been asking us for ages to come up with a class that they could use all of their left over scraps of paper and ephemera. 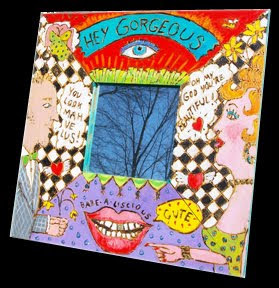 Out of their request, Soul Collage was born. The focus was to dig deep into their spirit and find images that had personal meaning and significance. Using a 5X7 canvas, some students incorporated words and text, while others used color and texture. Of course, glitter made it into almost everyone’s canvas. The finished product was easy to pop into “ready made” frames with mats that will make a wonderful gift! ShaDeeLa’s February workshop was Keepsake Pouches, a class that guided students in creating unique pouches intended to store the most precious of treasures. 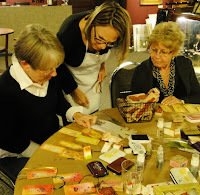 Instructors Sharon, Dee and Deb demonstrated how to turn a felt swatch into a keepsake. Students learned simple embroidery stitches, custom appliqué techniques and were encouraged to add personal touches such as buttons, beads and tassels. Simply hung up for display or given as gifts, students walked away from this workshop with a stunning and personalized present to be treasured for generations to come.